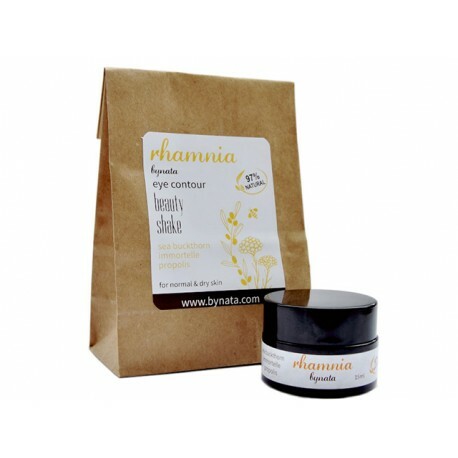 Rhamnia Eye Contour Cream supplies the skin with precious moisture, successfully restores lipids, smoothes pleating and makes a great deal with wrinkles. One of the main reasons for using an eye contour cream has much to do with fine lines, puffiness and wrinkles. Our goal is to reduce, eliminate, or delay their appearance in the eye area. Eye contour is the first place on human face where time leaves its traces, because the skin structure is more specific and vulnerable. The epidermis is thinner, drier and the emotions most often expressed by mimics, leave their mark on this delicate area first. Rhamnia Eye Contour Cream supplies the skin with precious moisture, successfully restores lipids, smoothes pleating and makes a great deal with wrinkles. It gently protects the eye contour, while combating dark circles and puffiness around eyes. 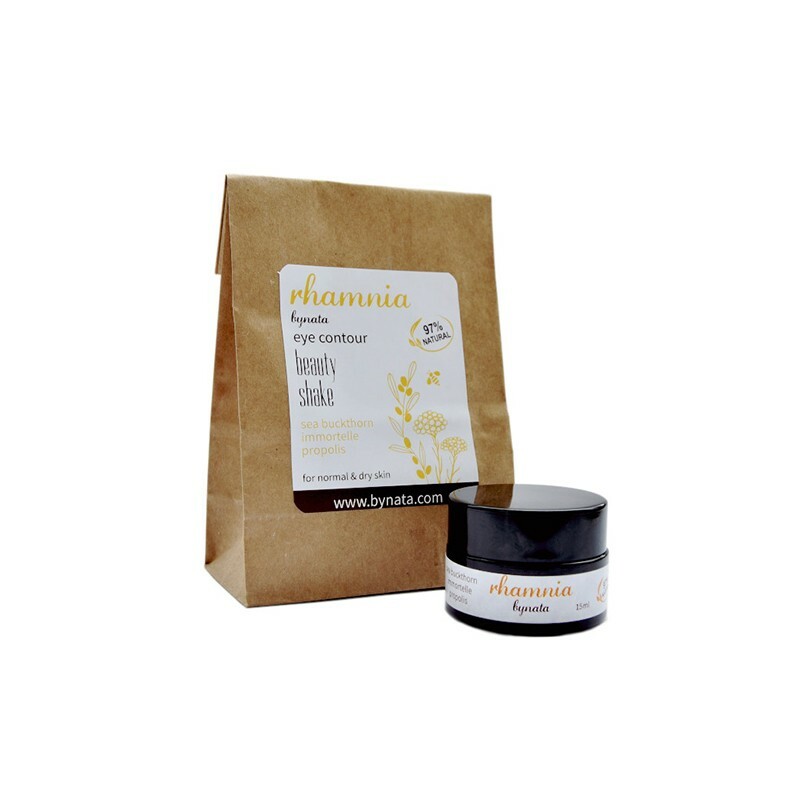 This happens due to the cream’s unique mix of active ingredients – sea buckthorn extract (which is an extremely good hydrating agent, a magical and powerful antioxidant and a skin protector), olive and almond oils, shea butter, allantoin, caffeine, vitamin E, hyaluronic acid and panthenol. With each application of Rhamnia Eye Contour Cream you will notice that the area around your eyes is well hydrated, calm and smooth. It is protected from harmful environmental influences, it is well-nourished and fast regenerating. Apply every day and night with confidence and smile! Aqua, Helichrysum arenarium Extract, Propolis extract, Lecithin, Carrageenan, Helichrysum arenarium oil extract, Phytosterols, Propolis oil extract, Squalane, Hippophae rhamnoides fruit oil, Coriylus avellana seed oil, Vitis vinifera seed oil, Olea europaea fruit oil, Cera alba (Beeswax), Xylitol, Caffeine, Ascorbyl-Phosphate, d-panthenol, Glycerine, Glyceryl monostearate, Polyglyceryl-3 methylglucose distearate, Tocopheryl acetate , Lactic acid, Maris sal, Zink sulfate , Magnesium chloride, Biotin, Citric acid, Benzyl alcochol, Ethanol, Ethyl hexyl glycerin, Tocopherol. Do not use in case of intolerance to bee products and / or nut oils! Due to the natural composition of the product (97%), there may be a difference in the aroma, consistency and color of the product in the different batches. The healing properties of sea buckthorn have been known since antiquity. The unique properties of sea buckthorn are used in folk and traditional medicine for treatment and prevention of many diseases. Sea buckthorn is very rich in Vitamin A. This vitamin is responsible for the hydration and elasticity of the skin; Vitamin E prolongs youthful skin.